The Ministry of Civil Aviation (MoCA) is toying with the idea of adopting a globally prevalent ‘different owners and operators’ and ‘fractional ownership’ concept of aircraft operations in India. Despite being not illegal, the concept has not been able to take-off due to several issues, including taxation complexities. Industry experts claim that the issue is of utmost importance, as India is all set to become the world’s second-biggest aviation market by 2038 with over 1 billion passengers expected to fly per year. As per the concept paper being studied globally, the largest aircraft operators in general & business aviation follow the models of aircraft management and fractional ownership services. “These two are the most popular and high-growth models. Notable examples of such operators are NetJets- 600 plus aircraft, Lux Aviation- 225 plus aircraft and Tag Aviation- 80 plus aircraft, which are spread across several state registries. There are many other examples reads a concept paper which is being studied by the MoCA along with other departments underneath it. In sharp contrast, all of India has less than 450 aircraft (less than the largest individual operator–NetJets). Not only is our fleet size small, the growth rate of this fleet is also quite low in India (< 2% per annum). The growth rate would get a big boost if the two models are facilitated to operate in India, the concept paper adds. As per the model, the operator takes on all aircraft-related responsibilities, legal liabilities & regulatory compliances, and ensures safe and compliant operations, leaving the owner to concentrate on core business, the concept paper adds further. As per the analysts, the corollary benefits of having aircraft management and fractional ownership programs are huge. Some of which includes direct employment to skilled workers -pilots, engineers, technicians, airport staff, etc. Further, it allows the fleet base to increase, which in turn benefits indirectly-related industries like MRO, fuelling, ground services etc, to grow. According to an industry source, the fractional ownership business in India has several policy hurdles, including that of owner-operator issues, taxation on buying and selling of fractional shares, depreciation spread across multiple asset owners, safety and efficiency of aircraft operations. Captain Rajesh Bali, MD, Business Aircraft Operators Association (BAOA), a lobby group, claims that the concept of aircraft management companies has not really picked up in India due to lack of provision for different owner and operator. “Once this is allowed, a lot of private businessmen will buy aircraft and hand them over to an aircraft management company, which will take all the responsibility of managing and operating the aircraft and the owners can use the aircraft depending on their needs,” said Bali. 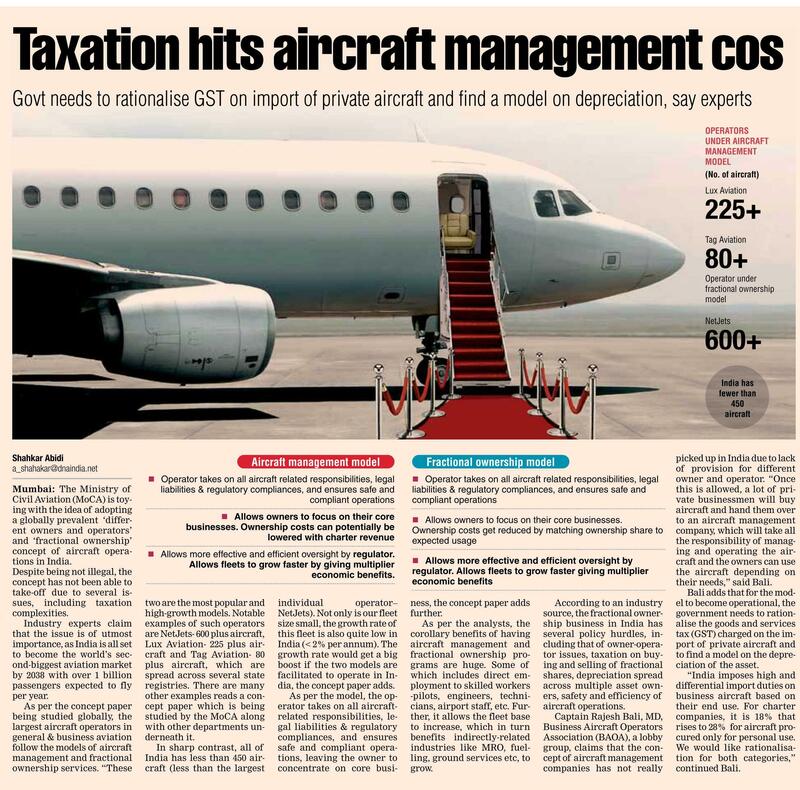 Bali adds that for the model to become operational, the government needs to rationalise the goods and services tax (GST) charged on the import of private aircraft and to find a model on the depreciation of the asset. “India imposes high and differential import duties on business aircraft based on their end use. For charter companies, it is 18% that rises to 28% for aircraft procured only for personal use. We would like rationalisation for both categories,” continued Bali.